First off I want to say Birthday Blessings to you Gram!!! I know you're not here with us to celebrate your birthday, but you're in a much better place to celebrate. Have fun celebrating with the LORD. I love you so much! You'll have a balloon floating toward Heaven soon. Second, I want to say that it's Chinese New Year Celebration on One By One The Flamingo's Are Stealing My Sanity! Be sure to stop on by. She has many things in store. After all we are celebrating her birthday ALL this month. After this little tidbit about Chinese New Year I'll put her button here feel free to click and hop over to see her. Don't forget to wish her Birthday Blessings!! Chinese New Year is the longest and most important festivity in the Chinese Lunisolar Calendar. The origin of Chinese New Year is itself centuries old and gains significance because of several myths and traditions. Ancient Chinese New Year is a reflection on how the people behaved and what they believed in the most. Now for my project for the celebration. I did this for my little one. Yes, you may have guessed that's Baby Yoshi, but I didn't get the chance to add the white like I wanted because soon as he spotted this card it was off and in his hands. He loves it and that's all that matters to me. 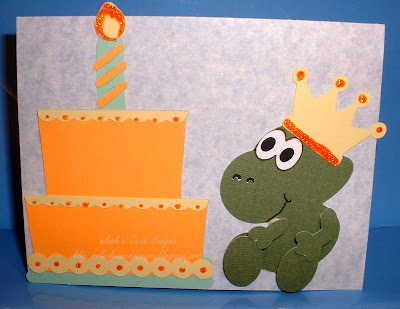 The cake was cut from Sweet Treats Cricut Cartridge, page 38, cut at 4"
The Baby Yoshi was designed in Cricut Design Studio, measures about 2.25"
I had so much fun in making this card. I had another design in mind, but then my little one came in my office with this on (mind you these were taken back at Harvest Celebration) - you see where my mind went, LOL. (Laughs to self -- well ok, you can laugh with me) I just couldn't resist doing it. Then when it was done I didn't even have time to take a picture of it before my little man came in my Craft Studio and swiped it from my desk and was off again. I managed to grab a snapshot this morning, but before I get caught I must return it to it's place of rest where my son had it. Hehe, I can always make another so no worries on this Mom's shoulders. Thanks for stopping by today. Don't forget to go over to Karel's Blog and help her celebrate her birthday. Have a wonderful day everyone! Love your blog and so happy to be on the Design Team with you.